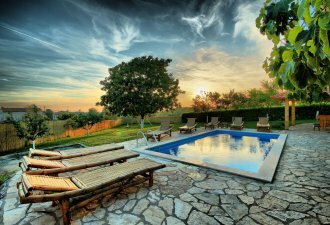 Villa Tia is a new built modern villa with swimming pool that is located on the edge of the village Mofardini near Sveti Lovrec and 18,5 km from Porec and its beaches. The house was built in 2015 in attractive modern style with big glass walls facing the west in all rooms and has a property of 2000 sqm with well-maintained lawn, swimming pool of 32 sqm, barbecue fireplace, spacious sun lawn and a big parking place for 4 vehicles. The interior is furnished with attractive modern furniture and the spaciousness of the whole house offers its guests an exceptional level of comfort. NOTE: THE POOL IS HEATED OUTSIDE THE SUMMER MONTHS. Villa Tia has a total living area of 283 sqm and 73 sqm of terraces on two fully air-conditioned floors. On the ground floor there is a living space with fully equipped kitchen, dining table for 8 persons and a living area with leather sitting set and satellite TV, one double bedroom with double bed, private bath/toilet and satellite TV, separate toilet, playroom with billiard table and soccer table, steam bath and another shower/toilet. On the first floor there are three double bedrooms with double bed, private bath/toilet, satellite TV and balcony with panoramic sea view and a laundry room in the hall. NEW IN 2019: fully equipped summer kitchen in in the covered terrace in the garden.